As more money rolls into the Crystal Coast, it evolves into a whole new beach. 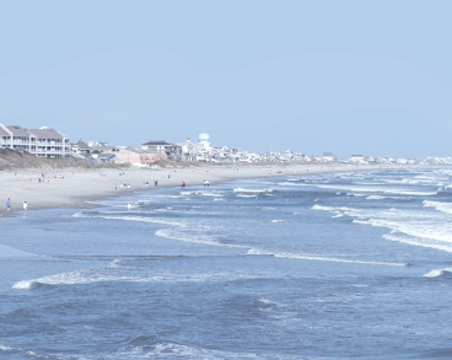 The Crystal Coast has always been something of a well kept secret among North Carolina beachgoers. For years, tourists and residents have been drawn to the area by the friendly atmosphere and quiet charm of a relatively undeveloped beach community, often overlooked for the famous beaches of the Outer Banks or the tourist and golfing mecca of Myrtle Beach. But now the secret is out and the Crystal Coast is starting to come into its own as a first-class destination catering to people looking for a new playground with money to spend. If developers have their way, within a decade the only thing recognizable to past visitors will be the pounding surf and the unmistakable smell of salt in the air. New and increasingly expensive real estate is popping up on the market nearly everyday, with the quaint beach cottages of the past being bulldozed in favor of modern timeshares and condominiums. 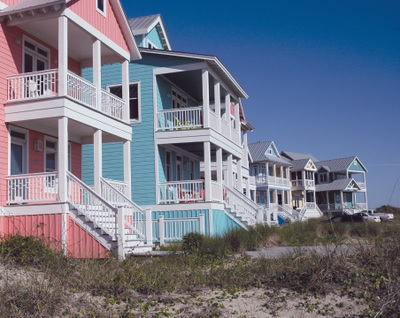 A recent survey of real estate around Emerald Isle, for example, showed houses and other recently built properties ranging in price from a few hundred thousand dollars to several million, and they don’t seem to stay on the market for very long. While some are resistant to change, many local leaders, residents, tourists and business people are embracing the area’s facelift as the best way to head into the 21st Century. No matter how people feel about the evolving look of Carteret County, there’s no arguing that the changes are here to stay. ​“There’s no question about it,” says Carol Lohr, executive director of the Carteret County Tourism Development Authority. “We’ve had explosive growth over the last year and a half, and tax revenues are increasing every month.” You don’t have to go far to see what Lohr is talking about. Perhaps the best example of the changing face of the community is right in the heart of Atlantic Beach. Just over the bridge from the mainland, The Circle was perhaps Atlantic Beach’s most iconic symbol. It was a taste of a boardwalk carnival right off the sand, where teenagers spent time cruising on a Friday night to see and be seen. Beach bums sipped their brews, relaxing in clapboard bars or pool halls, while the sound of the Ferris wheel and go-carts were always providing the background rhythms to this summer party. Today, most of that scene is gone. The bars are closing one by one and even the Ferris wheel was recently auctioned off piece by piece. The Circle as it was has been swept away to make room for the vision of Wilson developer Fred Bunn, a vision local leaders are embracing wholeheartedly. Bunn has been working closely with the town to help turn its centerpiece attraction into something truly world-class. Bunn snapped up nearly $2 million worth of The Circle, and he sees it becoming a pedestrian friendly community filled with shops, restaurants and other classy attractions that would appeal to residents and tourists alike. Where the Ferris wheel once reigned, The Circle will be dominated by large, towering condominiums — Atlantic Beach with a skyline. Bunn hasn’t been content with revitalizing just The Circle. He and other developers have been buying whatever properties they can find that can feasibly be rebuilt bigger and better, from cottages to aging hotels and shopping centers. This kind of growth has the potential to invigorate not just the real estate market, but the area’s entire service and entertainment industry. With these new affluent residents and visitors pouring onto the island, they’ll be looking for things to do. Of course, sitting on the beach and watching the tide roll in will always be the island’s number-one attraction, but people can’t stay on the sand 24 hours a day. They’ll want things to see and do, from attractions like the recently renovated North Carolina State Aquarium at Pine Knoll Shores to unique events like Beaufort’s tall ship festival, where the area’s nautical past comes to life. They’re also bringing their golf clubs with them, and The Country Club of the Crystal Coast (formerly Bogue Banks Country Club) has been paying close attention to the new expensive condos that seem to be popping up like sea oats. As the only golf course on the island not covered with wooden blocks and fiberglass jungle animals, The Country Club is in an enviable position. Since this wave of growth, the course is evolving from its modest roots as a public course into a semi-private resort catering to this new wave of potential big spenders. But why all the growth now? 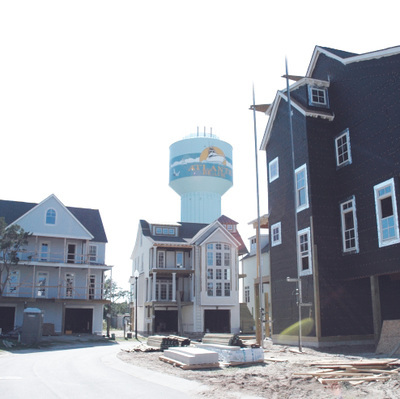 Sure, beach communities have always been a fertile ground for growth, but the Crystal Coast has spent decades maintaining its own status quo. So what’s driving this recent surge in development? Lohr says it was a matter of everything falling into the right place at the right time. Jack Goldstein, who has been involved in Carteret County real estate since the early 1970s, says a new breed of homeowner will soon be apparent. He believes a more sophisticated consumer base will benefit the area. “The man that’s going to buy a three-quarter-of-a-million to a $1 million condo is going to be better off financially than the man that’s got a camper,” says Goldstein. “Not that there’s anything wrong with the man with the camper; he’s just doesn’t have the spendable income that that man that’s going to spend three-quarters of a million on a condo. So personally, I think this will help the restaurant business and retail and so forth.” Even with the rapid increase in property values, the Crystal Coast is still one of the most affordable coastal markets in the Southeast, Benson says. It’s just another reason why so many people are trying to get in on the ground floor in this chapter of the area’s history. So how much more growth can the Crystal Coast expect? No one knows for sure, but this beach community is going to ride the wave for as long as it can.